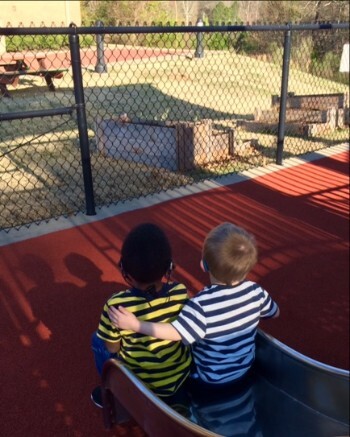 The mission of the Memphis Oral School for the Deaf is Empowering Deaf Children to Listen, Learn, and Talk. Our whole history, educational philosophy, and programs revolve around this simple, yet powerful, statement. In the case of hearing-impaired children, additional resources are required in order to provide a solid educational foundation and an equal opportunity to succeed. Memphis Oral School for the Deaf (MOSD) exists for the purpose of ensuring that these unique resources are readily available to those young children who need them. With the combined support of the community and MOSD, deaf children in Memphis and the Mid-South area continue to have the opportunity to listen, learn, and talk. Memphis Oral School for the Deaf (MOSD) is located in Germantown, Tennessee and works to empower deaf children to listen, learn, and talk. MOSD has been serving families from all over the Mid-South since 1959. At MOSD NO SIGN LANGUAGE is used. We help profoundly deaf and hard-hearing children ages birth to six years old learn language during the most critical developmental stages of their lives. We believe that through early intervention and diagnosis, speech and language therapies, and advanced technologies and audiological services, deaf children can develop necessary listening and spoken language skills to become a part of, rather than apart from, a world of sound. We serve our Spanish population with an on staff interpreter for MOSD parents while promoting bilingual language development for our Spanish-speaking children. MOSD is one of 42 OPTION Schools in the world with the goal to advance excellence in listening and spoken language education. MOSD is accredited by the Tennessee Department of Education. Our highly qualified staff of audiologists, speech pathologists, and educators is licensed in the state of Tennessee. We serve as an observation and training site for Audiologists and Speech/Language Pathologists and educators from universities across the country. Better spoken language and auditory outcomes are associated with oral deaf education. Since 1992, over 90% of children with profound hearing loss developed intelligible spoken language. Children enrolled in a program focused on listening and spoken language showed an average of one year or more of language growth for each year in the program. At the end of a four-year period, the gap between chronological age and language age was nonexistent. With the technology (hearing aids and cochlear implants) and early auditory-verbal intervention available today, a child with hearing loss CAN have the same opportunity as a child with typical hearing in order to develop audition, speech, language, cognition, social skills, conversational competence, literacy skills and academic skills.